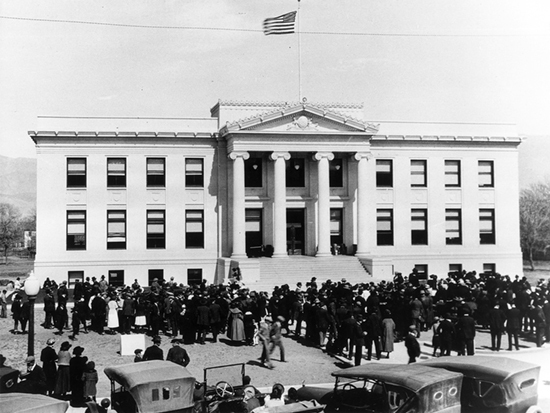 After three previous courthouses were lost to earthquake and fire, Inyo's fourth and current courthouse was built to resist both. The region's only example of monumental Neoclassical Revival public architecture, this courthouse was placed on the National Register of Historic Places in 1998 in recognition of its "integrity of feeling and association." It was here in Independence that 24 members of the Manson Family were jailed in 1969 for possession of stolen vehicles and property. Within days of his preliminary hearing, Charles Manson was indicted in the Tate murders and transferred to Los Angeles.